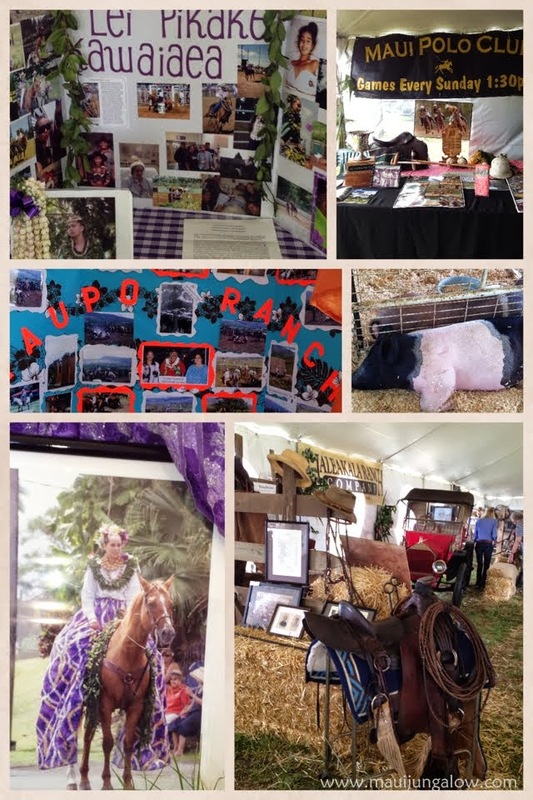 Maui Jungalow: Upcountry Fair - It's Not About the Beach! It’s kind of like the Maui Agriculture Festival held in the spring, a big farm fair, but with a more western horse ‘n saddle vibe. The Upcountry Fair is a relaxed event that stretches out on Saturday and Sunday (so it's not just a one-day festival), and has plenty of parking on-site. Admission is not free; it’s $3, but includes parking. I imagine Saturday was the busier day. Sunday was mellow and casual. Upcountry Maui is not just a place, but a mindset... It's not the beach culture of Kihei or Laha'ina, it's not touristy and ritzy, it's not glamorous. It's more about hard-working local families and their connection to the land. The fair is not located in central Maui, so it requires a trek up the mountain to the lush, eucalyptus-drenched area of Olinda, just above Makawao, the cowboy + yoga + art town of Maui. Held on the Oskie Rice arena, the Upcountry Fair includes rodeo style events like cattle roping and looping lassos. 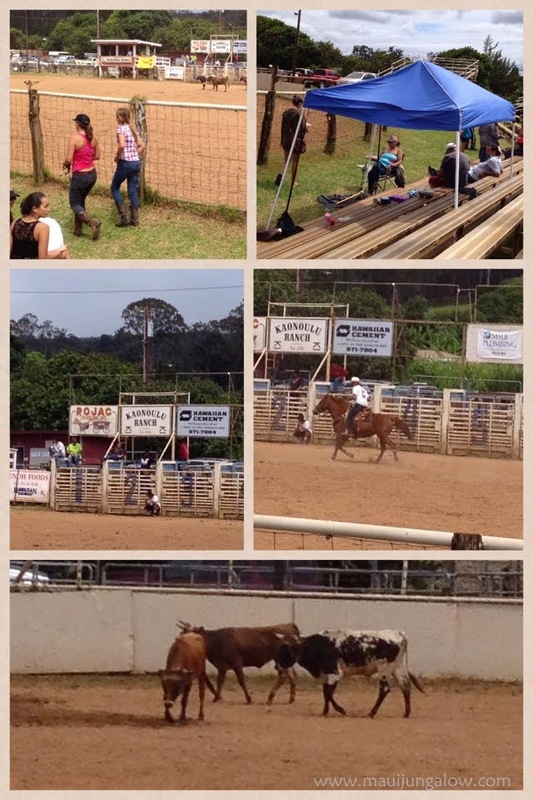 and the calves are kind of indifferent to the whole thing until the roping competition begins. Here's a link to a short roping segment from Sunday. Of course, there are local food booths and livestock competitions, a pie eating contest, an animal petting zoo, live entertainment, informational displays on ranch life and upcountry Maui history, and plenty of craft vendors. There may have been more agricultural displays or demos on Saturday by the 4H Club, but I was there on a Sunday. If you’re a history buff, the old-time photos will be fascinating. 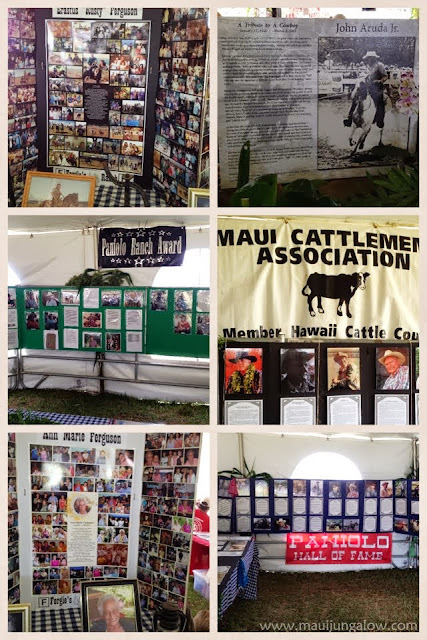 There is display after display of pictures with cowboys and ranch hands, newspaper clippings, and tributes to beloved Maui residents. including "Rusty" and Ann Marie Ferguson and John Aruda, Jr.
Kaupo Ranch display, a blue ribbon pig, and saddle display. On Sunday, Jeff Peterson, a slack key guitarist was performing. I was really impressed by his talent and had not heard of him before, but he’s highly regarded in the local music scene. ‘Opihi Maui makes local-style decorative signs with Hawaiian words and phrases. 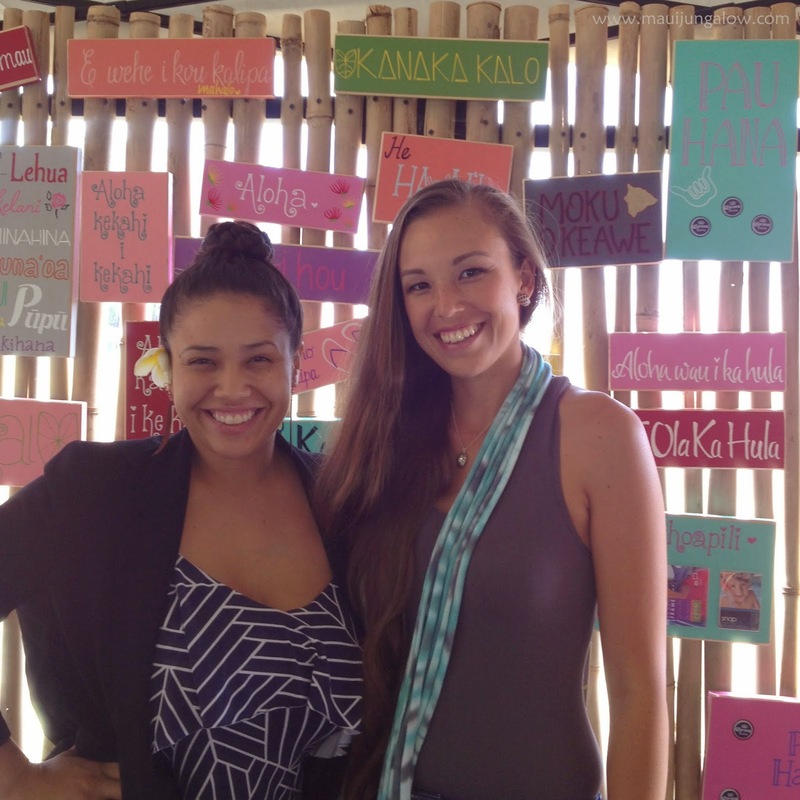 The creative duo of Kiani Yasak and Celina Lucos-Rojas made some signs to give as gifts this past Christmas, then friends asked to buy them. Within a few months, a new business was born and they have been making a lot of signs and going to craft fairs. The signs are nicely finished, with smooth edges, and a keyhole in the back for hanging. Amazingly, they hand letter all the signs very carefully with paint pens – no stencils, no computer transfers. For an extra flourish, they use bottle caps for decoration. They also do custom orders. Celina and Kiani, creators of 'Opihi Maui. Humics Maui offers soil amendments to revitalize and restore soils. They are involved in some large scale soil remediation projects. They had a huge stack of papers on the left side of their booth, from a website on soils of Maui County. The quality of Maui soil varies widely and many areas are depleted farmlands. See the left side of the photo above for Humics Maui contact info. I recognized Kathy Kaohu as the teacher of an herbal wreath making class that I took years ago. Maui’s a small world. Sometimes you run into people again and again, in different ways. Kathy’s son is very involved volunteering for the Waikikena Foundation, which teaches Hawaiian agricultural practices and culture, and a place I’ve been wanting to visit. Kathy Kaohu, my wreath teacher, and her son. 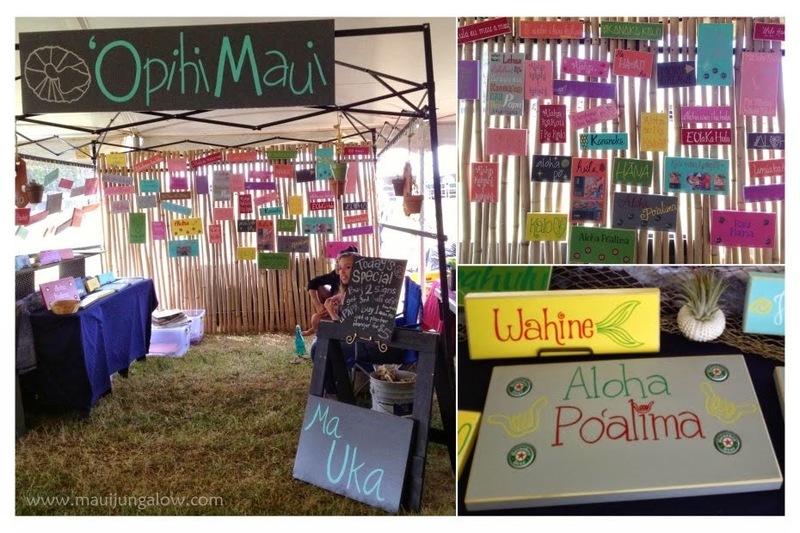 Some festivals give you a good sense of Maui life, and what values are important here (at least in the more rural part of Maui), and the Upcountry Fair is definitely one of them. Good post. I grew up in rural Western Nebraska on a small horse ranch and I farmed during the summers so I'm very familiar with this way of life. 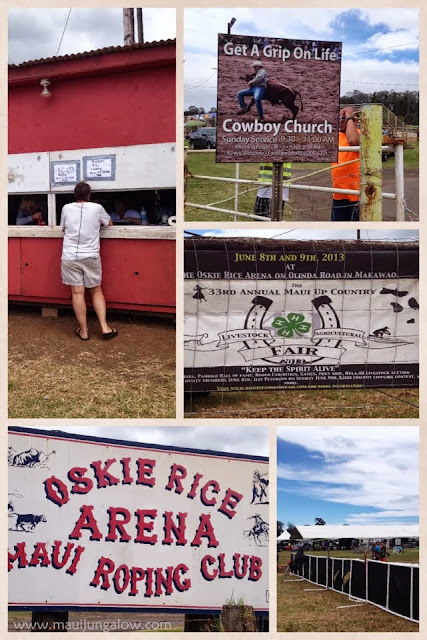 I didn't know there were cowboys on Maui, I thought it was all surfing, waterfalls and volcanoes. Thanks for setting the story straight. You'd feel right at home, I'm sure! There are cowboys on the Big Island too. Not so many on the other islands.